Lesson structure can be seen as a core aspect of teaching; the method in which lessons are planned can influence the whole learning process. Most teachers plan the structure of their lessons using a few well established techniques. One is a three level approach commonly known as a traffic light sequence, as shown below. This traffic light system can be used for assessing pupil progress and for differentiation of tasks, as well as clearly showing the lesson structure. This system however has various limitations. For example, this system implies that unless a pupil “moves” from one colour to another, progress has not been made, even though the pupil’s understanding may have been deepened. The criteria for progress also have to be correct; a pupil could, for example, achieve the red objective in the figure above without completing the amber, as these may not be progressive objectives. Variations of this include but are not limited to: Bronze, Silver, and Gold gradings; any sort of official assessment (i.e. Grade E, D, C etc..); All, Most, Some gradings. Other versions exist, of which two are of particular interest. One is the use of a learning arrow (figure immediately below), which uses differentiated colours to extend the basic three level system into 5 or 7 criteria of progress. The second version could be described as the trouser method ( lower figure below), which is task differentiated based upon criteria. A previous article on this site demonstrated how graph theory can map connections and links between concepts, for educational planning. 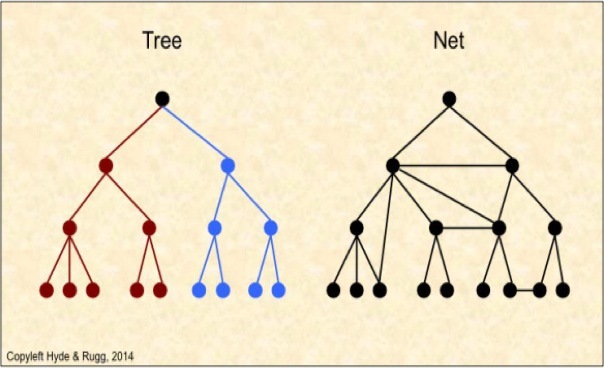 Two formats are trees, where branches never re-join, and nets, where branches can re-join (see below). This mapping functionality is a powerful tool, as it has been shown to have a wide variety of semantic uses. Learning has been described using the semantic metaphor of a journey; the learning arrow incorporates this idea, and to some extent so does the trouser method. 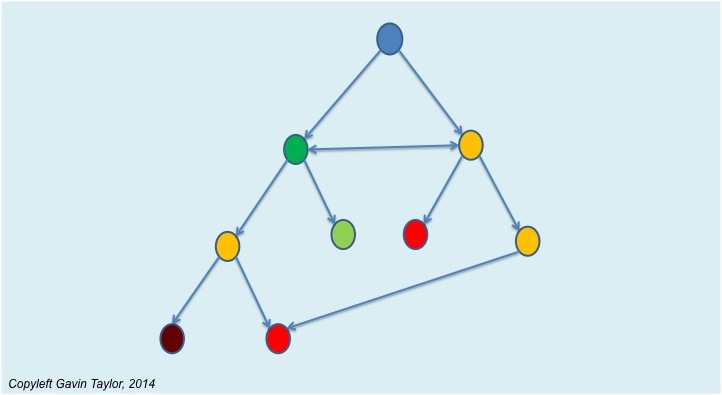 This however can be better represented using graph theory, as each node in graph theory could represent a task or objective with relevant links shown between each node, like different routes on a map. A net representation has various advantages over other methods. These advantages include teachers being able to demonstrate differentiation in their planning, and pupils being able to track progress either throughout a topic or throughout a lesson. The net representation allows differentiated planning, because various different links between tasks or objectives can be created, to allow the teaching practitioner to tailor the lesson map to the class. 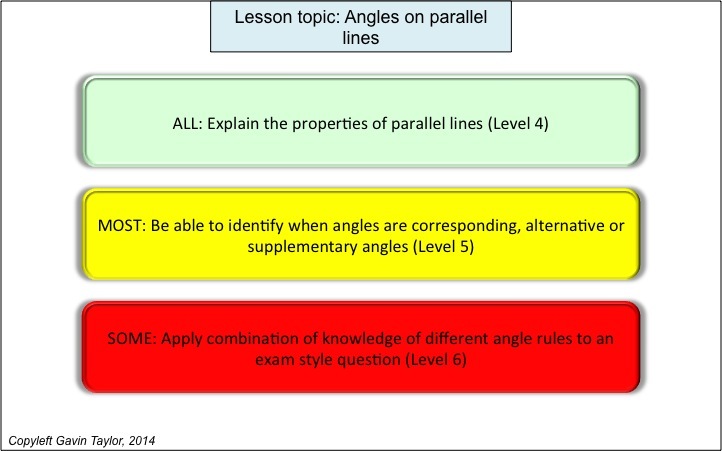 As a wider implication, this also allows teachers to plan the path of learning for a subject, and how each topic fits into the scheme of learning, where links can be seen by teachers and pupils (shown below). 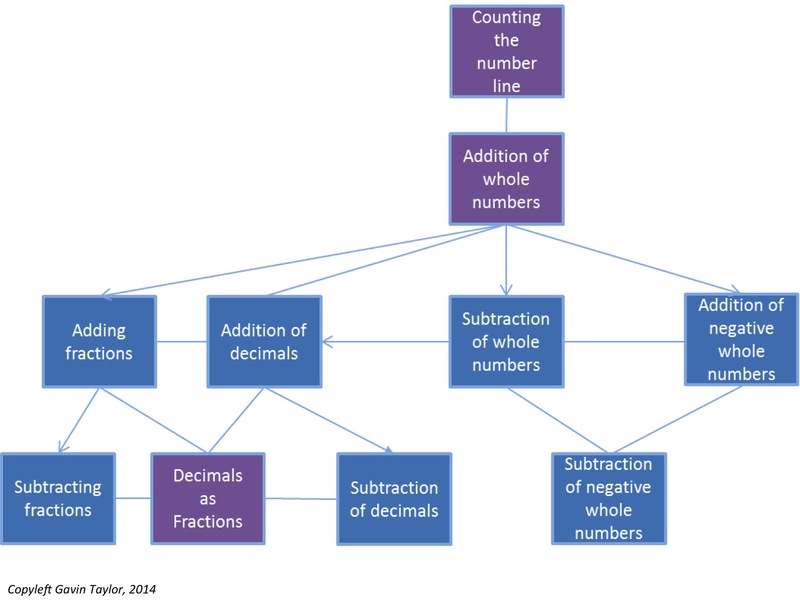 The figure below shows how this may look for a simple Maths example of understanding how to add and subtract whole numbers, decimals and fractions. The purple boxes show core concepts that act as “gates” to the next area. However, a pupil can decide what route to take to cover all the items shown, rather than having to take a single prescribed route, giving the pupil more control. Also, the student can see precisely how the different topics are connected to each other. Within the lesson, tasks could be differentiated based upon selected criteria and then a pupil could navigate a route that started and finished at a set destination but gave them freedom to define their own learning journey, with input and feedback from the teacher. This would give pupils more control over their learning, within a focused area of the topic. Also, the pupil and teacher would be jointly accountable for progress, which would allow for a more in-depth discussion of areas of weakness. Assessment control points could be implemented within the tasks, to allow for self-assessment and teacher assessment, and this again develops a tailored lesson for every pupil, without too much more work for the teacher. 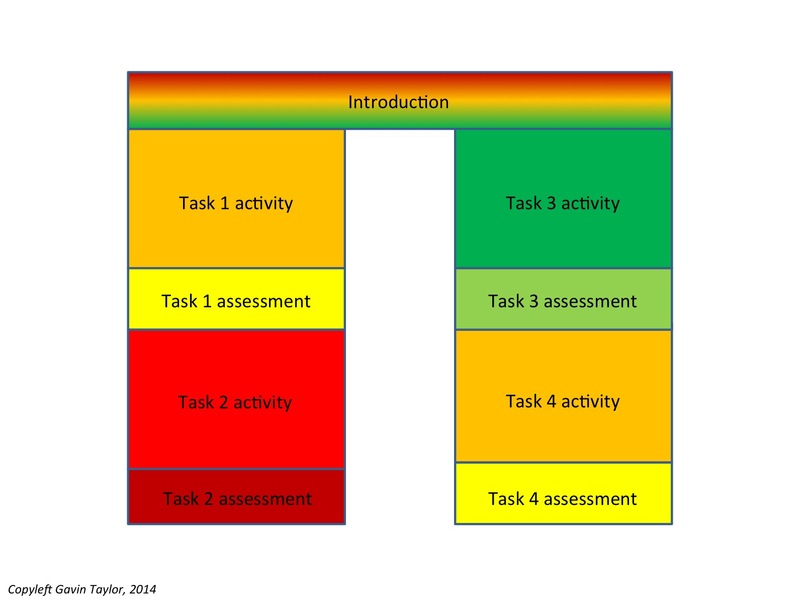 The example shows how differentiated criteria or objectives determine a “task” and “extension task”. 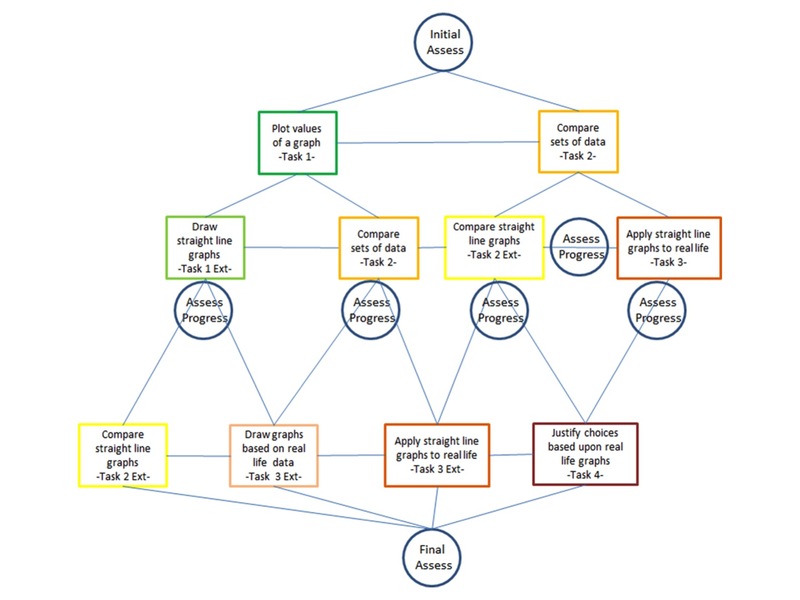 From these a path can be made from the top to the bottom, allowing progress to be made in some aspect, and allowing for independent learning, particularly if this diagram is printed and given to a pupil at the start of the lesson. This could be developed further to include teaching slots or even a timescale to show how long each task should take. 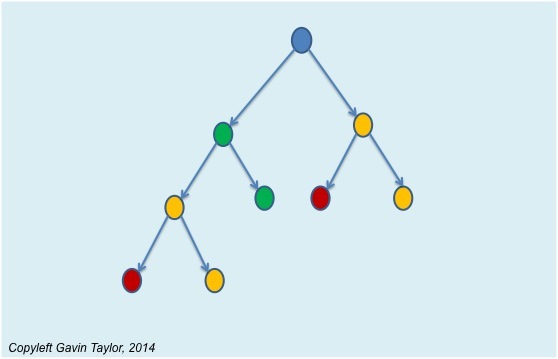 This approach can be developed and adapted, since graph theory has a strong underlying body of theory, as well as being easy to learn at the level needed for this application. The example below shows how teaching slots and time frames could be implemented into the system. 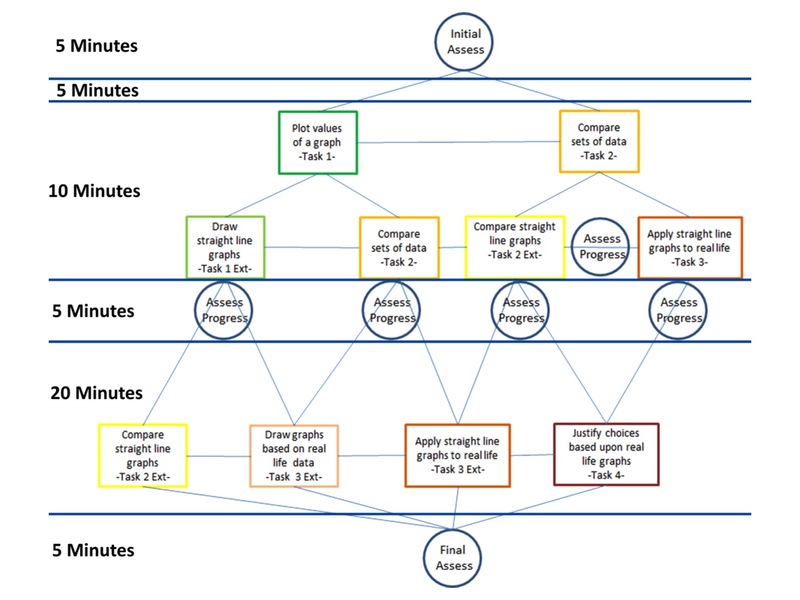 The use of a timescale as an extension of this net representation allows for progress to be measured against time, as well as measuring understanding. This has two implications. Firstly, pupils have no excuse for spending 40 minutes on a task just to waste time, where no or little progress is being made, and secondly, this allows target setting of how much work needs to be done within the lesson, where pupils can decide this pace with some freedom, but within controlled boundaries. You’re welcome to use and adapt the diagrams above; I hope you find them useful. All figures used are copyleft Gavin Taylor, unless otherwise stated either in text or on the image itself. You are welcome to use Gavin Taylor copyleft images for any non-commercial purpose, including lectures, provided that you state that they’re copyleft Gavin Taylor. You are welcome to use Hyde & Rugg copyleft images for any non-commercial purpose, including lectures, provided that you state that they’re copyleft Hyde & Rugg. 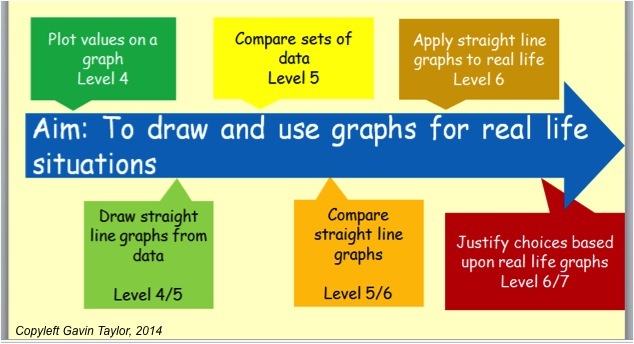 This entry was posted in education theory, our research, useful concepts, visualisation and tagged Graph theory, learning outcomes, lesson planning, lesson structure, visualisation of lessons by hydeandrugg. Bookmark the permalink.